A few of us local Denver Boardies (FM_OFFAL FM_JEREMY B and I) have decided to add a Mountain Standard time PRF BBQ this year. We currently have secured a venue that will host Saturday and Sunday all day including music, second room for art, food and congregation. This is early planning stages and we are of course looking for a few more core volunteers on the critical items. Friday night will be at a local venue, we are renting a sanctioned DIY spot called the Bakery that is downtown for saturday and sunday activities. Good access to light rail and busses can be had from the downtown spot and certainly walkable to Air BnB areas. Please email prfdenver@gmail.com if you would like to play and if you would like to attend since we will be getting a list. Also looking for volunteers, for art, food, brewing etc. Canoes! Kayaks! Climbing walls! Walks in the woods! Goats! Campfires! Amish donuts! Chill vibes! PenRF – Christy is organizing another reading of your original short stories, flash fiction and poetry! Chris Jury Guitar Clinic – learn how to setup and maintain your guitar! 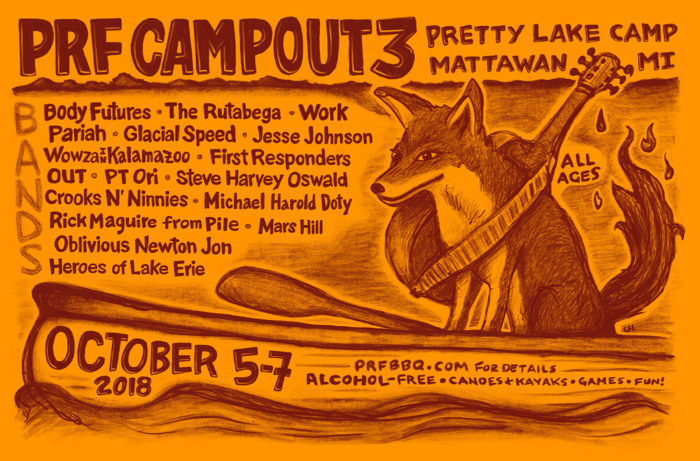 As usual, don’t forget about the peaceful walks in the woods, petting goats, kayaking/canoes on a lake so pretty they named it Pretty Lake, and a legit rock-climbing wall along with countless other campfire surprises! This event is all-ages and excellent fun for kids. ALL CAMPING/FOOD RESERVATIONS MUST BE IN AND PAID FOR BY SEPTEMBER 21st! NOTE: Due to local zoning, no alcohol or pets are allowed on PLC property. PRF NYC is a gathering of independent music fans and friends that met through Electrical Audio’s forum section. This will be the second hosting of the PRF ( the jocularly dubbed “premier rock forum”) in New York City, following previous PRF events in Chicago, Milwaukee, Louisville, the San Francisco Bay Area, among others. 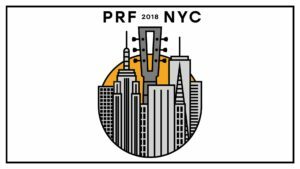 United by a shared interest in record engineering, independent music, and aluminum guitars, PRF NYC is an event to bring this community of bands together. Want to go? Donate $40 via Paypal to jhastie@penguinrandomhouse.com to get on the donor list. Donors get into all 4 events. Donations and raffle proceeds – minus expenses which we are doing our best to keep modest as hell – will be split 50/50 between Depression and Bipolar Support Alliance and Sarah’s Circle. Friday Night: IBW Illuminated Brew Works located at 415 N Sangamon (N Sangamon & W Kinzie) in Chicago’s West Loop. Saturday & Sunday: Workshop 4200 is located at 4200 W Diversey (W Diversey & N Tripp) in Chicago. Please use the main entrance located on Tripp Avenue. Q: I can only go to one night, do I still have to donate $40? A: Hell yes, where else are you going to eat, drink, and watch 6-16 great bands for $40? Q: Can I repost this elsewhere? A: No, this information is available everywhere it needs to be.